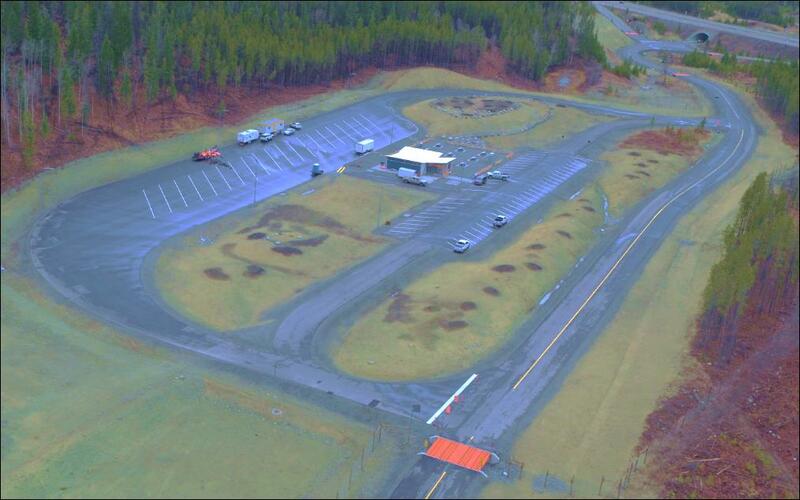 Overhead view of facilities at the new Loon Lake Rest Area on BC Highway 97C. Our 170 BC Rest Areas are the perfect spot to refresh and recharge before heading out on the highway, and they are about to get a whole lot better. 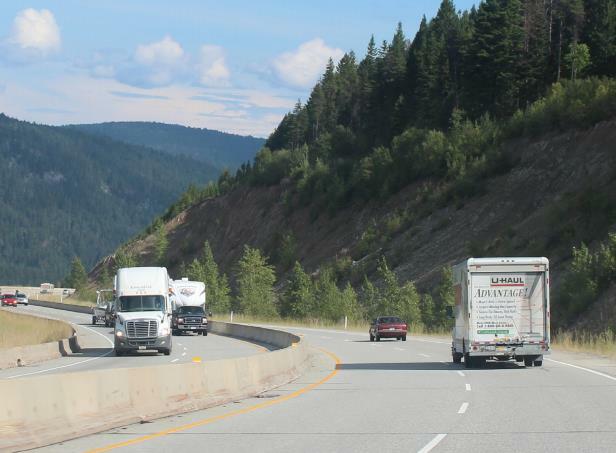 Since the beginning of 2016, we’ve been working closely with the BC Trucking Association on the BC Highway Rest Area Survey and report. We wanted to get the voice of the trucking industry – what they like and what they don’t like – about rest areas in the province. Their input is important to improving rest areas for everyone. In total, 835 people took part in the survey. Of those, 72% were long-haul drivers, 19% were short haul drivers, and 9% were local delivery drivers. Upgrading restrooms to flush toilets, creating more truck parking and installing improved lighting. Offering commercial services at rest areas, like service stations, shower facilities, convenience stores, restaurants/diners, fast food restaurants and other amenities. Enhancing existing rest areas by upgrading washrooms to flush toilets, improving lighting, adding more picnic tables, and increasing accessibility and capacity. Building a new Class A rest area at the Loon Lake Interchange on Highway 97C (Okanagan Connector) between Merritt and Kelowna. This rest area has heated restrooms with running water and flush toilets, separated parking areas for buses, commercial trucks and recreational vehicles, and lots of parking for commercial trucks. Looking into commercial services at rest areas, by issuing a request for information on BC Bid, to gauge industry interest in providing goods and services at BC rest areas. We will be offering free WIFI at select rest areas across the province. In total, 25 rest areas throughout the province will have Wi-Fi installed. 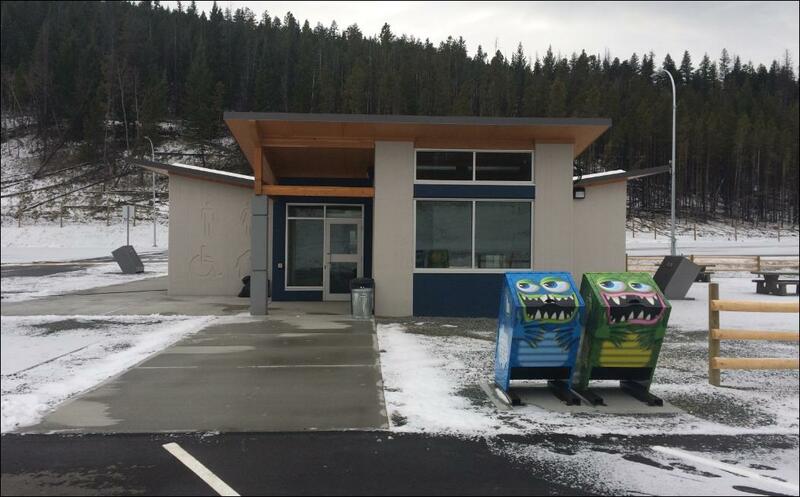 Garbage and Recycling Gobblers wait patiently for you outside the new Loon Lake Rest Area. BC’s mountains, rivers, oceans and deserts make road trips here a wonderful thing. The province’s awesome size also means highway travellers of all kinds need places to take a break, to help them stay alert on their journey. Do you have a question about BC Rest Areas that we haven’t answered here, or any other transportation related question? Let us know in the comments below. Hello. What are the odds that I will get a lost item returned to me? I left my Acura chip car keys in the ladies washroom of the Coquihalla Lakes SB rest stop around 3:30pm today. I would really like to get them back. Would the cleaning service be able to contact me when they get them? Thank you! Sorry to hear! The maintenance contractor is VSA, so best to contact them to see if they’ve come across your keys: 1-888-315-0025. Adding DC quick charging for EVs is much appreciated at Loon Lake rest area! Unfortunately, like many others in the EV community, we own a Nissan Leaf so we can’t make it to Merritt so this new Loon Lake rest area charging doesn’t help us. Would love to see DC quick charging added to the Coquihalla route somewhere near the summit. Thanks for these great suggestions Alan – we will pass them forward on your behalf. Can you confirm and if so, when is it expected to go live? We’ve asked and will let you know what we hear back. We chatted with the area manager who doesn’t have any firm dates to give you. We are working with BC Hydro to install the necessary infrastructure. Stay tuned! Thank you for keeping us up to date. This possible Fast Charger link is very important to so many of us. Has there been any more word on Britton Creek fast charger? Can you also ask if they will be installing a level two backup? Thank you again. We’ve sent your question forward. Stay tuned. Hello again – the project is currently underway. There were some delays in the hydro/planning department regarding location. We are not managing this project and don’t have any firm dates for completion. The goal is the end of June in time for the summer season. Hope that this helps. A very well used rest stop and info centre just outside of Merritt was recently closed. It served travellers going to and from Hope, Kelowna and Kamloops. It is badly missed. Yes, we have heard that it will be missed. But there is another visitor info centre still located in Merritt and we hope folks find our new rest area useful as well. What about Self-supported Cyclists? What is the logic behind prohibiting people from sleeping over night in a tent at a rest area? It seems to be unethical to prohibit overnight sleeping for anyone. We have done some digging and have found that not all rest areas have “no camping” signs posted. Often they are posted when it’s found that longer-term camping is becoming a problem at a particular rest area. Rest areas can be dark, secluded and remote which lead to safety concerns regarding those camp overnight. Overall, in terms of overnight stays, rest areas were originally envisioned for motorists who are too tired to continue driving and need to pull over and rest for a few hours, but we don’t believe that those who are homeless are turned away. Alternatively, BC Parks campgrounds cover the province and are accessible day and night to travellers seeking inexpensive camping. Hope that this helps! These rest areas are a bonus to have, just last summer I was on a trip from the coast to Calgary and back in one shot….guess age is catching up with my as on the return trip I was quite sleepy by the time I got to the Salmon Arm area. Found a nice rest stop near town with ample parking and I stopped and managed to catch 6 hours of sleep. There wasn’t a lot of people there and I parked out of the way. Had a washroom handy for when I woke up, continued the trip from there rested which is important for driving in the terrain we have here. These things are not only great for truckers but the average traveling public like me. What the ministry needs to do is make sure they are well kept and accessible. The one outside of Salmon Arm was a nice one compared to others I’ve stopped at, clean quiet and allowed for some serious zzzzzs. Just wish my home province had these! As a woman travelling alone I rarely stop at rest areas. They are often out of the way, dark and unsupervised. Having services would definitely reduce the scary isolation of so many of them. Thanks for your comment. We have shared it forward to the program manager. While the initial roll out areas for WiFi coverage are nice, some consideration should be given to Zopkios on Hwy5 southbound. That nice mandatory brake check/rest area before the Smasher has somewhat LIMITED cellular coverage, so some decent WiFi and/or a micro-repeater here would benefit not only the general public but specifically commercial truckers. Thanks for your feedback. We have shared it forward directly with the project manager. We shared your comment forward with the project manager and they confirmed that Zopkios is under consideration for free WIFI, however nothing has been confirmed at this point. Stay tuned! Thanks, good to know. I would think that with the ongoing Telus “major corridor cellular upgrade” ongoing and this new rest area/WiFi upgrade, that some improvement will result, hopefully sooner rather than later. And, FWIW, some “boots on the ground” experimentation of weak coverage would reveal good likely areas for timely upgrades. Not terribly hard to look at signal strength bars or try to make an outgoing call. There is a 200-foot Telus cell tower right at the Zopkos brake check, it’s been operational since summer 2014. This tower supports Telus/Koodoo/Bell/Virgin (calls to 911 will go through for Rogers customers) The signal from that tower cuts out around Box Canyon. Telus has applied to build a tower near Portia which should cover the dead zone between Shylock and Box Canyon, but I haven’t seen any timeline for construction. With Rogers (and Fido, and even Cityfone) now with Extended coverage, Rogers customers (on eligible plans (which is most of them, basically anything without a my5/my10 option), you’re able to roam now on all Telus(Bell) towers. Even Freedom (formally Wind) has an Away roaming agreement. For the tourism is overnite stays allowed at rest areas in BC. Perhaps having signs indicating distance to the nearest Campground at the Rest Areas would be appropriate. It’s hard to ‘go check a website’ when your on the road, and no wifi is available. So signs showing where the nearest campsite (including privately owned) is. Has more truck parking spaces been made available or just improvement to existing spaces/rest areas? Just to clarify – do you mean at one specific rest area or at rest areas across the province? Rest areas across the province. In other words, will there be more spaces available for truckers driving through the province or just better facilities for existing spaces? Thanks for the clarification. BC on The Move committed $9M to be spent on rest areas between 2015/16 and 2017/18 (inclusive). This money is used to both rehabilitate and build new rest areas. One example of new spaces being created is the new rest area along highway 97C (https://news.gov.bc.ca/releases/2016TRAN0269-001721). An example of improvements that have been made is the installation illumination at Fish Trap rest area along H5 just north of Kamloops. Hope that this helps! If you have any other questions, don’t hesitate to let us know. Bradner rest area has no flushing toilets in female washroom and getting worse with every vehicle that stops. What about those of us who are not involved in the trucking industry? Has the tourism sector been consulted? Especially for overseas visitors traveling by RVs, a more rustic, non-commercial experience is desired by many. This means more rest areas, on lower volume highways, with minimal services (pit toilets and picnic table), in scenic locations. BC has much to offer! For commuters in the Interior of BC, the most important factor is frequency of rest areas, especially in difficult travelling conditions (winter storm), just to give a peaceful rest from driving. A move to keeping rest areas that do not need winterizing open longer in the season is also beneficial. Thanks for your comment and your kind words about our beautiful province. We have shared your comments forward with the Rest Area program manager.